GreenDan.org: Bottled Water or Tap Water? Which is better, bottled water or tap water? I know we have great tap water here in San Francisco, perhaps some of the best in the world, but it turns out that the water in Cleveland is good, too. 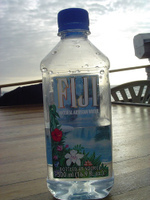 The ads for Fiji Water sold around the world proclaim that "The label says Fiji because it's not bottled in Cleveland." The back of the bottle contains information about trade winds purifying island water -- water not affected by acid rain and other pollutants. Cleveland Water Department officials said their test results showed Cleveland's treated drinking water is better quality than Fiji Water. They said Fiji Water had the highest levels of arsenic and other contaminants. NewsChannel5 held a blind taste test. The taste testers preferred Cleveland water. I learned about the story this morning, listening to the authors of "Thirst: Fighting the Corporate Theft of Our Water " on KPFA's The Morning Show. "Thirst" was reviewed in Sunday's Chronicle. Some San Francisco restaurants are switching to tap water because it's sustainable, local and good. "Our whole goal of sustainability means using as little energy as we have to. Shipping bottles of water from Italy doesn't make sense," says Mike Kossa-Rienzi, general manager of Chez Panisse. When it comes to water, Americans chose bottled stuff to the tune of 26 gallons per person last year, according to the Beverage Marketing Corporation. That's $11 billion worth. Restaurants are a small, but influential, part of that. Their move away from bottled water reflects concerns not about the bottom line, but about the environmental costs of bottling and transporting water, the energy spent recycling the glass, and keeping plastic out of landfills. I had a vague sense of the environmental costs, but was still surprised to learn that in just one year, we Americans consume plastic water bottles that require "47 million gallons of oil, enough to take 100,000 cars off the road and 1 billion pounds of carbon dioxide out of the atmosphere." As of today, I'm giving up bottled water, and will do my best to educate my friends and peers about the real costs of bottled water, as well as the advantages of tap water. I recently heard an expert on the radio state that it takes 2 liters of water to create the plastic bottle that contains 1 liter of water. Not exactly conservation-friendly.